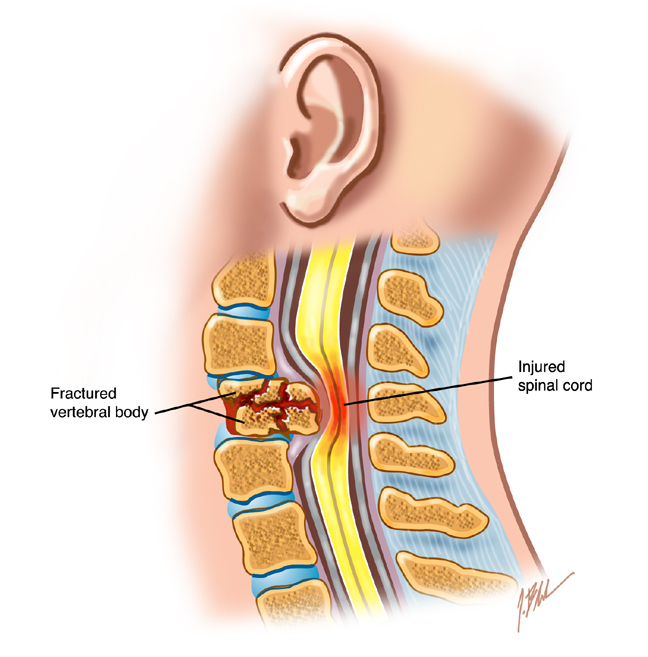 A catastrophic cervical spinal cord injury occurs with structural distortion of the cervical spinal column due to actual or potential damage to the spinal cord. Damage above the C5 vertebrae in the spinal column results in the greatest risk of immediate sudden death for an athlete. 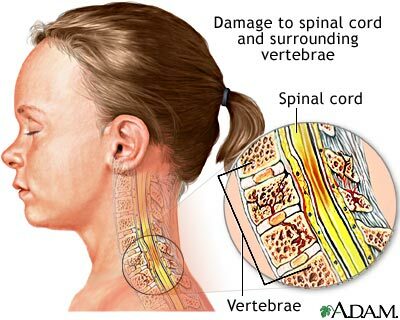 Above this level, damage may impair the spinal cord’s ability to transmit respiratory or circulatory control from the brain. 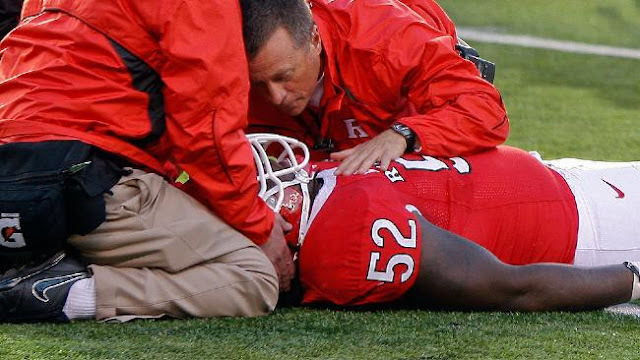 Effective acute care is critical in preventing permanent dysfunction or death in an athlete as a biochemical cascade of events can occur during the initial 24 to 72 hours post-injury. When treating a cervical spinal injury, stabilize the spine in a neutral position immediately. Avoid applying traction to the cervical spine to create as little motion as possible. After manual stabilization of the spine, immobilizers such as foam blocks or straps may be used. If rescue breathing becomes necessary, the person with the most training and experience should establish an airway using the safest technique. If the athlete is in a position that prevents treatment of the airway, slowly realign the cervical spine. However, stop movement if the athlete experiences increased pain, neurologic symptoms, or muscle spasms. Prepare for transport to the nearest hospital. The team physician or athletic trainer should accompany the athlete to help guide equipment removal. If possible, remove equipment to clear access to the airway. Remove helmet and shoulder pads if necessary. Athlete may return to play only after full tissue healing, neurologic recovery, and medical clearance from a physician. Casa, Douglas J., et al. “National Athletic Trainers’ Association Position Statement: Preventing Sudden Death in Sports.” Journal of Athletic Training, vol. 47, no. 1, 2012, pp. 96–118., doi:10.4085/1062-6050-47.1.96.